The key to making the 1Sky Solutions a reality is spreading the word far and wide. 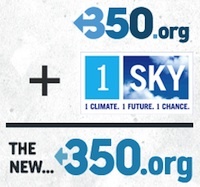 Use the 1Sky social media pages and your social networking sites to help support the climate movement and take a role in shaping the clean energy future. Let's tell President Obama to stand strong on the Clean Air Act for the climate and American's health! Join the 1Sky Facebook fan page to keep up-to-date on the latest climate and clean energy news and interact with others who care. Show your support for the Clean Air Act by becoming a fan of the act! You can watch videos and find other resources about why the Clean Air Act is important and why we need to protect it now. View all YouTube videos tagged with "1Sky"
Do you have video of a 1Sky or climate change-related event? Post the video of your event or record your own message about why we need climate action, and tag it with "1Sky" to join the conversation.